How far may federal judges go in second-guessing an extradition decision made by the Secretary of State? The question lay at the heart of a Student Scholar Series presentation given before faculty and students on March 20 by Catholic University law student Elyssa Lacson, Class of 2013. She explored a case from 2009 in which the Ninth Circuit Court of Appeals creatively applied the Administrative Procedure Act to block the extradition of a Filipino man to his home country, despite the fact that the move had been approved by then-Secretary of State Condoleezza Rice. Lacson concludes that the court had exceeded its authority. 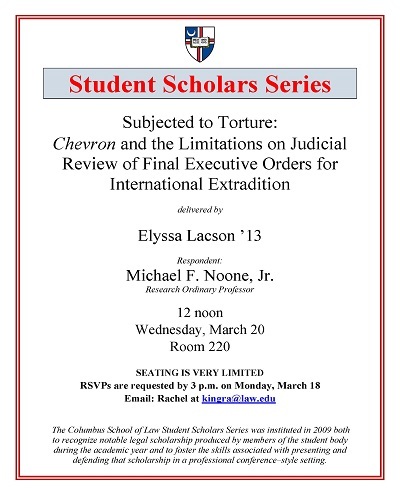 Lacson, Elyssa, "Subjected to Torture" (2013). Student Scholar Series. 14.